VPS hosting can be termed as ‘hybrid’ in nature. Just like shared hosting, it hosts your website on a large server, which is also running other websites at the same time. However, your website is assigned a personalized space with its own CPU, Ram and Disk space, similar to a dedicated server. For bloggers, small business owners or even for individuals, VPS is the best option its efficient traffic management, reliability, security and of course it is affordable. Which Best VPS Hosting Service Should I Use? That’s a very good question! You might have come across multitudes of different hosting companies each claiming to be the best. For your convenience, we will break it down and provide the list of 10 best VPS hosting companies we have come across, and then would compare the top 3 VPS hosts. FatCow’s basic VPS plan starts at just $19.99/month offering 1 GB ram, 40 GB storage and 1 TB bandwidth. For first timers, it gives 20% off, while the next payment would cost $24.99/month. Other salient features comprise of 24×7 customer support, free domain name registration, personalized email account and a simple to use website builder. 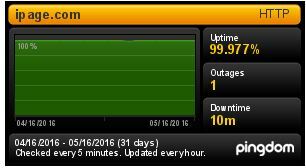 Their uptime report is very promising with overall uptime of 99.907%. GoDaddy’s standard VPS plan starts at $24.99/month and offers similar features as FatCow including 40 GB storage, 1 GB RAM and 1 TB bandwidth. It is more expensive than FatCow, however the uptime report shows GoDaddy with overall uptime of 99.967 %. GoDaddy gives you an option to select either Windows or Linux OS as per your convenience. Moreover, each plan offers free SSL certificate and 3 dedicated IPs. GoDaddy also prides in rendering 24×7 customer support. While the DreamHost ‘Start Here’ plan is fairly affordable at just $15/month, it has one big disadvantage; non-availability of site builder. Nevertheless, it includes 30 GB storage, and unlimited bandwidth and domains. The Ram can be extended to 8GB plus all VPS servers offer a user-friendly web based control panel, 24/7 customer support and impressive Ubuntu long term support. PCMag has even awarded DreamHost with the Business Choice Award 2015. The host has an overall uptime of 99.779 %. Surprisingly, I couldn’t find the uptime report of JustHost on uptime.besthostratings.com, nevertheless the company promises a 99.9% uptime. If it falls below that, you get a month’s free hosting credit. The standard plans starts at $14.99 ($29.99 after first month) and gives 2 GB Ram, 30 GB storage, 1 TB bandwidth and one domain. The customer support is amazing and always ready to answer your queries. JustHost utilizes cloud technologies such as OpenStack and KVM to keep their servers up-to-date at all times for an uninterrupted online presence. Reading the reviews online, I can tell that a lot of people have had up-time issues with the host. HostGator’s Snappy 500 plan is currently priced at only $9.98/month (originally 19.95/month), however it presents you only 512 MB Ram, 25 GB Disk space and 0.5 TB bandwidth. Though, the server is semi-managed, but you can upgrade later to a fully-managed server. The reason for its higher rank on our list is its reliability. Upgrading from one package to another will not affect your uptime, nor will it go through a long restore/ backup process unlike many other hosts. Whether you are a newbie or a professional, MediaTemple proposes two basic categories in VPS plans; self-managed VPS and managed VPS. The self-managed is for advanced users and starts at $30/month with 2 GB Ram, 20 GB storage and 2 TB bandwidth. The best part is that you get to choose between different operating systems like Ubuntu, Debian, Fedora and CentOS. The managed VPS plan starts at $55/month and tenders almost the same features except the storage is 30 GB. Limited number of web-app available for quick installation. Most of them including Joomla, OS Commerce and Gallery have to be installed manually. The best thing about Arvixe is its 99.977 % overall uptime. The basic package starts at $40 offering a fully managed VPS with 50 GB dedicated space, unlimited monthly transfer, 1.5 GB Ram, 2 domains and unlimited sub domains, ftp accounts and domain aliases. Each and every feature is mentioned with the plan and you won’t have to dig in or contact the support to ask about certain features. For an unbiased review, we won’t specifically rank them, but provide you with a detailed comparison of all three to help you choose the best VPS hosting service. On the first look, the InMotion hosting plan appears extremely attractive, but it is priced almost double the Bluehost and iPage standard plans. The Bluehost ‘Enhanced Plan’ provides exactly the same features as the InMotion basic plan; however, it costs $59.99/month (regularly) and is limited to 2 CPU cores. The iPage business plan extends slightly upgraded features, nevertheless it is still costly compared to InMotion hosting plan. The uptime history is exceptionally important, as it tells you about the reliability of your web host. The higher the uptime, the better the host is. The uptime history of Bluehost and InMotion was found at uptime.besthostratings.com, while iPage’s history was obtained from Pingdom. Not much of a difference, but of course the iPage’s uptime is comparatively higher than other two hosts making it more reliable. excellent analysis, though missed many important points in this review, but comparison is useful indeed!